Fan Bingbing’s (范冰冰) younger brother Fan Chengcheng (范丞丞) broke into tears in front of his fans at a recent Nine Percent fan meeting, leading to speculations that Fan Bingbing’s tax evasion scandal may be much worse than reported. In early June, the Chinese media reported a rumor that Fan Bingbing, China’s highest-paying actress, was being investigated by the State Administration of Taxation after she was allegedly discovered to have been using “yin yang contracts” to avoid paying hefty taxes. Fan Bingbing’s production studio and her representatives have yet to release official comments about the matter. 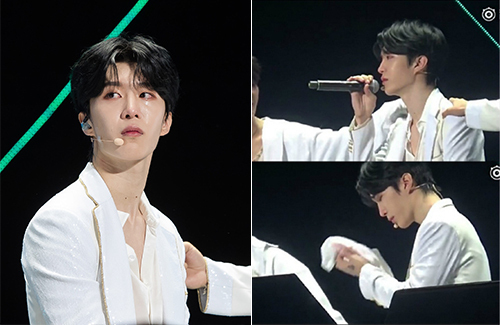 At a Nine Percent fan meeting yesterday, Fan Chengcheng cried, two times, during conversation segments with fans on stage. At the fan meeting, which was held in Nanjing, China, the 18-year-old mentioned that the Nanjing stage would be his last event for Nine Percent, as he will not be attending the fan meeting in Bangkok, Thailand. Though he did not clarify why, it is speculated that Fan Chengcheng cannot leave the country due to his sister’s situation. There is also a rumor that Fan Chengcheng has been removed from various endorsements and variety show appearances, also because of his sister’s scandal. Although this is tough on Fan Chengcheng, his sister is a big girl and should know better not to try and cheat the Mainland government of taxes. I feel bad for him, as this must be hard on him. Young Chengcheng will learn from this, and hopefully not repeat his ‘sister’s’ mistake. At least there is no death penalty in China anymore for tax fraud. Punishment shouldn’t be too harsh. Fan Bing Bing should come out of it fine unless the country want to make a great example…. Everyone probably has dirt on everyone in China. In China its whether the government wants to go after you or not. @jimmyszeto Tax fraud is not good ofc. But you think other people who are in higher class and stronger than her didn’t do it? All of a sudden, it was Fan BingBing. This issue has got to be more than tax fraud, like maybe. Fan BingBing probably stepped on someone in higher position’s toe. And no, I don’t support her wrong doing if she really did commit it. Everyone does it it but does not make it right. If someone commits murder and gets away with it too, should we do the same to the people we hate?When people are brought up in that environment where everyone is committing fraud, it is very difficult for judge what’s right and wrong. It’s very likely that FBB was naive rather fully calculative. You are right! It might not be just simple tax evasion hence the secrecy. Could be fraud of substantial amounts and attempts to escape abroad which means heavier crime. It’s weird because if Hong Kong then past colleagues will be interviewed by media on whereabouts. In China, everyone has to keep silent and media coverage is censored. @jimmyszeto I’ve stated I don’t support her if she really did commit tax evasion. I just think there are alot more we don’t know and it could be that she stepped on some government’s toe. Also, why don’t they bring down the corrupted officials first? Those who know the laws and in power should be punished first and receive heavier punishments. However, they are the ones getting away(most). And that is what happen in every country though. @terrycrews19 you are so right. Unfortunately, Fan Bingbing was a scapegoat in all this. Thing is, she did not have to be. She knows how the government will mow you down, and should’ve paid up. Again, everything you said is true. We all know that Jackie Chan is a strong supporter and a darling of the chinese government. The only reson his son got so little time jail for his marijuana possession is because on a global and public scale, the judicial system’s hands were tied. They had to sentence Jaycee, or it would have started chaos in China, and throughout the world. If that was Fan BB, she would have gotten years in jail, as FBB is no government palm greaser. It’s just hard to say when everyone knows how China is. The disappearance of FBB for the past few months is something to worry about. Being on house arrest for FBB’s troubles is something to sympathize with for FCC. His entire career, not only as an artist but future endeavors unrelated to the ET industry, have been ruined. I would cry too, if I were him, or probably even harder because it’s scary. I’m sure his family is being harassed and watched at the moment. I don’t think it’s fair to treat him like a criminal, when the tax evasion, so far, only involves FBB. However, once the government is after one family member, the entire family will not escape unscathed. I don’t have a problem with the government going after those who break the law, but to force the entire family into house arrest isn’t just either. That’s why it’s hard to say what the truth is in this situation. Is it really just tax evasion? Did she really evade taxes? I’m not too sure after all. FCC is still a teenager. He probably doesn’t even fully understand what is happening right now. One thing is for certain, though, whoever is after FBB wants to shut her down permanently. @lynn90 it’s strange, because if you are first time tax evasion offender, all you need to do is pay the fine. You don’t get house arrest or put in jail. You only get put in jail if you are multiple offender. So there must be something else. FBB’s rise to A list quite sudden, so maybe she offended whoever helped her before? I think it depends on the sums of money involved and also if it is an isolated incident. Since it is happening in her company, the situation might be dozens of contracts are uncovered at once to be manufactured to avoid tax. In that case, Fan Bingbing might be charged as a serial offender…. From what I have been reading, it seems that FBB is a serial offender and has done many other things that has supposedly landed her in jail. I feel bad for her brother as he is still young but FBB should know better. I bet she thought she can get away with it but sadly,it is not the case and now she has to pay the price for it. @hetieshou serial offender? Can elaborate? I was reading more info this and it seems a lot more serious than just tax evasion and you truly wonder if FCC was also involved in this and their parents too. I have a feeling it is much more serious than what we have heard if it meant she has to go jail and banned from leaving the country too. Sadly this is where greed will lead you. I am glad my late parents always taught me never to be greedy or do anything dishonest just for money because if you ever get caught, you will suffer the consequences and regret it for the rest of your life. It appears that that is happening with FBB. I heard that due to this incident, the government will now limit the amount any leading actor/actress gets paid for any production. I find they are already way overpaid but yet still refuse to pay taxes. Go figure! I know and it is fine to have your own production company and all as many artists do. However, just like with any business, be honest and do everything legally and pay your taxes. I guess she and her team just let greed get a hold of them and now they end up like this. I agree and if she was like Tony who just focuses on acting instead of cheating money, she would not be in this mess. It is ok to have investments and all as Carina does it too but just do it honestly. Plus, I like how grounded and humble Tony and Carina are in spite of their wealth. They seem to live pretty simple and grounded lives. Tony is very frugal even though he is very rich. I admire that very much. I am glad my late parents always taught me to never be greedy and do dishonest things just for money. Money comes and goes but the sins that we commit will always haunt us. Sadly people value money too much these days that they would do anything bad just to make more money. There should be a limit to everything including greed. I agree. Greed is an addiction. FBB has billions anyway. What you can buy with 20 billion net worth, you can buy 1 billion. It is just pure greed to manipulate accounting and contracts to amass even greater sums of money. She wouldn’t have stopped either since greed is part of a person. The only way she would stop is when caught and here we are! I don’t get all the social media support from fans. Do they not agree with country laws? FBB has had her glorious career peak with Wu Zetian. Now she has left her family and TV stations who have invested into her series with her mess. The stations who have invested millions in purchasing rights to her series are unlikely to be allowed to show any reruns of her past series. One of the most successful actresses in China, her acting history will be wiped out as if it had never happened…. @hetieshou FCC is just 18 years old, how could he involve in this? He was just a kid over the course of Fan BingBing’s career. He’s FBB’s son …..oh I mean brother…sorry.He’s family so in China it is possible that he is committing similar crimes or knows about it. He could also be helping store or spend the illegitimate money. Even if FBB have not bought a single gift for them, in China they don’t see it this way…. Sadly, this doesn’t apply at all for corrupt officials in my country. Even after they’re caught (hundreds of them every year), they will smile and wave as if they’re A list star on red carpet. No one is feeling guilty. After they get out from jail, they’re going back to become official again and enjoy their wealth. @kmfayb It’s funny that you mention Jackie Chan, as there were reports earlier that claimed he was the one who “advised” Fan Bing Bing to escape to the U.S. and claim asylum so that Chinese government can’t go after her (he of course vehemently denied that he ever advised her when he was confronted by reporters about the rumors at an event). One thing these celebrities need to keep in mind is that the government does whatever the hell they want to in China – doesn’t matter how famous you are or whether you are good at kissing up to govt officials or not, they will still come after you if they feel inclined to do so (especially if you make them lose face). From the looks of it, seems like FBB’s case is more than just tax evasion. Whether it’s her or her company that cheated the government, the fact of the matter is that they are not going to let her off easily, especially now that the whole world knows about it (I was just reading an article in The Hollywood Reporter about it the other day). And yes, FBB should have definitely known better – it’s true that people do stuff like this all the time in China, but knowing how the government is over there, it’s basically at their own risk…if they are foolish enough to commit crimes in such an environment, then when the you-know-what hits the fan, they need to stand and face the consequences. I agree that if it was not circulated in the media then there was a chance that FBB can come to an agreement with the authorities and get off lightly. Now that there is talk that fraud is widespread within the country that even their most famous actress is in on the act then there is no chance she can come out unscathed. This will be an excellent opportunity for them to make an example out of someone so that others will think again before looking to commit similar crimes. FBB is very unlucky because it is part of the county’s culture and DNA to use power for financial gain. However when huge money and number of people participating, it is difficult to keep everything confidential. Only in China one can go from ‘Rags to Riches’ or ‘Heaven to Hell’ within a short space of time…. Of course Jackie Chan is going to deny, can we expect anything else. He kisses butts so he does not want to look bad. At the same time, he wants to look good in FBB’s eyes. What a character. Tell me something. Has there been any reports about FBB’s health, has anyone seen her. I thought that she would be allowed visits from her closest family members, and definitely her lawyers. Not a peek out of her family and nothing out of her lawyer. Is she even alive. One thing is for certain, she is involved in much more than tax evasion. The world knows what is going on, to a point, and that does not sit well with officals. They feel they have been made a fool of on a world stage, not good, they are angry. I would like to know how FBB is doing though. I hope that FBB does not come out in the next few months looking 20 years older. That would be career ending…. It would not be fair to pursue Bing Bing’s brother if sister is found guilty of tax evasion. But of course anything can happen in China. @lynn90 so well said. There could be something more to it than just tax evasion, maybe we’ll never know. You are right in saying that the family should not be dragged into the situation because of the actions of one member. Chengcheng is so young and something like this can ruin his whole life’s future. The Asian entertainment, educational and social world can be cold, cruel and unforgiving. Speaking of cold and unforgiving, it is worrisome in regards to the disappearance of FBB. I agree and FCC just started his career. I wonder what will happen to him in the long run? Yes the Asian Entertainment is a lot less forgiving than the western entertainment circle. Sadly, that is usually the case in Asian societies which is when one member does something bad then the whole family is affected. @hetieshou yes, this can have a negative effect on Cheng cheng’s career. He is just 18 yrs old. This is so hard for the family. This must be really hard on him for many reasons. Of course the chinese authorities will be watching him like a hawk now. 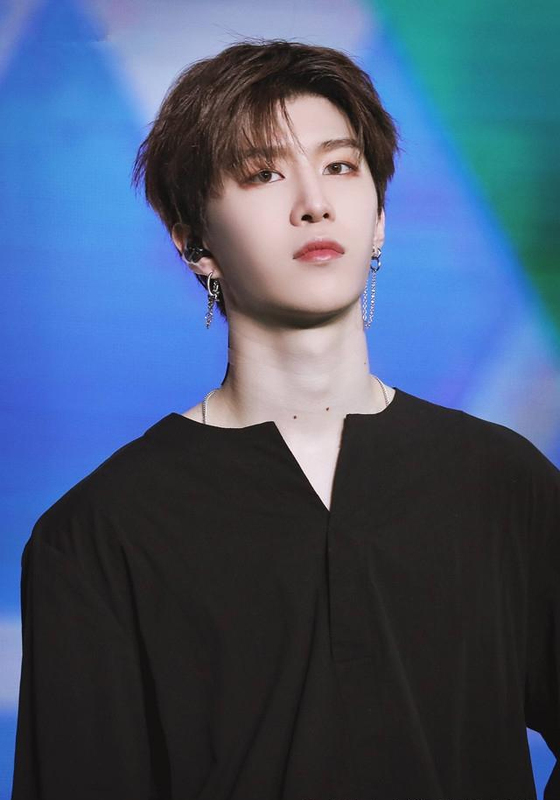 We can only hope that by some stroke of luck, the asian population is not so unforgiving towards Fan Chengcheng. It’s tough for him. He hit it off because of his sister, and now, it’s also because of sister. Eh seems like a PR move for sympathy from the public. Lets be real , how did FBB ever think she could get away from the whole tax evasion thing forever? She probably has many enemies (along w/ friends) within the industry who envy and hater because of her sudden rise to “global” fame circa ~2010 ish. FBB is very crafty with her image so i’m not too surprised it took this long for a major scandal (and one that involves government lol..) to potentially cause the downfall of her career. Well luckily for FBB she’s a household name so I don’t think the Mainland authorities can do much besides “banning” her. She can live with her millions or find a way overseas like so many other rich Chinese people. For those of you wondering where Fan Bing bing is, she is not in the USA, or is she under house arrest. She is in prison. I wonder the same thing and it is not just China. If you evade paying taxes in the US or do anything unlawful anywhere, you will have to pay the price regardless of the country. @hetieshou True, but it’s actually way worse if you do it in China, as escaping to overseas doesn’t necessarily mean you’re completely safe. I read about a local village chairman in China who spoke out against government corruption (local government officials were stealing land from the villagers and selling it to big box property developers, forcing the villagers and their families to be displaced) and ended up having to escape to the U.S….he gained political asylum and is technically under the protection of the U.S. government, but that hasn’t prevented him from continuing to get harassed by the Chinese government….it’s been a few years already but he continues to receive threatening phone calls to his house every week (he’s moved multiple times in the U.S. but they always manage to find him) and he fears for the safety of relatives still in China who are under strict surveillance by the government (and it’s not just immediate family….extended family and anyone closely associated with him are targets as well). And let’s not forget those HK booksellers whose primary offense was shipping banned books to customers who had bought them in China — two of those booksellers had foreign passports and didn’t even live or work in China, yet they still got nabbed and had to go through hell (and the countries whose passports they supposedly held were powerless in doing anything to protect them)…. I hope the escaping to the US attempt wasn’t true. Unless it to escape a life imprisonment or death sentence then there is no value to run. FBB is too popular for the Govt to back off without a fight. If escaping,she will have to worry for the rest of her life about getting knocked off after embarrassing the nation…. @cassie so FBB is really in jail. I feel bad for her on one sense, but on the same token, she should know better. I also heard that she was coached and encouraged on how to avoid paying her taxes. If this is true, FBB is an adult and she had the choice to say no, and walk away from indulging in tax fraud. If she is found guilty of corruption, tax evasion and heavens knows what else, she can kiss her lucrative career goodbye. Unfortunately, Fan Cheng cheng and the rest of the family will suffer too. I feel bad for her brother as he is just starting his career and all this happens. I hope that he will not suffer too much due to all this. I actually do not feel bad for FBB as she should know better. Greed sadly leads you to despair and many troubles. Luckily, my late parents always taught me to never to be too greedy as it is not worth it if you are doing something dishonest because once you are caught, you will regret for the rest of your life. I once knew some people who cheated the system here in the US and got caught and had to go jail and pay heavy fines. It is just not worth it. I heard about that too and must say that FBB is lucky as she is a known celeb with money. At least they are not letting her off completely as it would be very unfair. You are right that after a life of luxury, will she even be able to handle the minimum sentence/punishment? I heard that they will ban her for 3 years which is not too bad. She does deserve to get punished if she did commit all of the crimes she is accused of. @hetieshou your parents surely taught you well. I have seen the path where greed has led a lot of people down, and it is a nightmare road. You are right, in the US, uncle Sam collects his taxes. Even big name celebrities have gone to jail for tax evasion. I don’t even want to think about what will happen to FBB. From the looks of it, seems like she committed more than tax evasion. @hetieshou The US’ system is in favor of rich people anyway. @kmfayb the jail picture that was released last month seem to be fabricated? I don’t know how reliable my source is. I heard from a cousin in Hong Kong, cuzzie is well connected, that FBB is in jail, after a second arrest for falsified or illegal loans and corruption. I was told she might be put away for a very long time. That is all I can say right now. I was reading more about this and wonder how true it all is. The news was saying that she did more than just evade taxes but had illegal loans, signed Yin Yang contracts and corruption as you mentioned. If she is found guilty of all charges, she may be in jail for quite some time. There were also other reports saying how she tried to seek refuge in the US but I guess that attempt failed if she did try. The news was saying how the government will now they limit the amount that any lead actor or actress is paid in any production due to this incident. I guess they can see how overpaid actresses and actors but yet they still try to evade their taxes. Korean artists were caught evading taxes too. I remember Song Hye Kyo being one of those but she blamed it on her accountant and finally had to pay it all plus interest. She got lucky that she did not get punished. Anyways, I truly wonder if Fan Bing Bing will be able to revive her career after this whole ordeal? Or if she ever does, will she just grab what she has left and immigrate to the US or elsewhere? Let’s see and this all sounds like a tv series. @hetieshou I wondered that too, if she can make a fresh start. Then I realized if she spends a certain amout of time in jail, she will be past her prime when she comes out, and no one will really want to cast her. What needs to be considered is how will Fan Bingbing be mentally, psychologically , psychically and emotionally when she comes out. I think her acting career is the least of her worries right now….. If Liu Xiao Qing did not escape jail for tax evasion back then, I don’t see how FBB is going to escape some form of punishment. But Liu Xiao Qing still had some form of a career afterwards but never returned to the height of her career. FBB is probably going to follow a similar path where she would pop up in the news every now and then. I expect that FBB would shake your hand off if offered a 1 year jail sentence now. In China if they start investigating, there must be some real concrete evidence. It would be a miracle if they suddenly come out saying FBB is not charged. @elizabeth Who is Lu Xiao Qing? FCC is a very popular among young girls. And he is only 18. He can return to showbiz hopefully when the storm is over. One of the reasons if the family is implicated may be the distribution of wealth and shares among family members. LOL.. reminds me of the drama Stranger. @mangotango Even if not investigated though, family members can be used as the pawns to get the person who committed the crime to submit to whatever punishment the government decides to dole out. That’s what happened with 4 out of the 5 HK booksellers, who all admitted their guilt and even went so far as to record video confessions (which were broadcasted on national TV) and also kept silent about what happened to them even after they were released – threatening the safety of family members is actually a powerful tool that the Chinese government has no qualms about using. So basically, if you’re expecting to commit a crime in China and get away with it scott-free (or even just go up against the government in any way, shape, or form), you better be a loner who has no family, friends, or anyone of meaning you’re close with because that’s pretty much the only way to guarantee they won’t be in harm’s way due to your actions…otherwise, it would be foolish to even try…. @mangotango Hey sorry1 I made a Typo. It was Liu Xiao Qing who played Empress Wu and Empress Cixi ages ago. You would think that after living multiple lifetimes, 4-6 months of filming at a time, as this righteous, selfless, and good person onscreen, none of those virtues or morals ever rubbed off on her?! Anyway, if FBB is guilty as charged, may she receive her deserved punishment and nothing more. Prisoners are still entitled to their own respect and dignity. They’re not there to be abused or raped, but that’s the harsh reality. On the brighter side, at least she’ll finally get to see who are her true friends, not that it really matters for people who cheat and commit fraud. It definitely is a hefty and expensive lesson, but I hope she learns from this instead of holding animosity that she couldn’t get away in time or who betrayed her and whatnot. The best solution is to be at peace when the consequences come. I mean, whether you live in pain or peace, the situation doesn’t change. What is done is done, but you can survive through it and become a better and stronger person. @lynn90 men who act in idol dramas and do all the romantic roles are often times not very romantic in real life. reel life doesn’t translate into real life, unfortunately. with that said, i don’t know the full circumstances of her situation, so i’ll withhold judgment. but if she did do this completely aware going in, then she’s definitely at fault. we’ll see what solid evidence the gov’t comes up with. with such a high profile actress, they can’t hide the details of her imprisonment. We learn a lot more from the environment we grow up in and the people around us than what we do in work. I do feel very sorry for FBB because she probably thought nothing of it because everyone was doing the same. It does not feel like a crime when everyone is into it. Everyone will always at risk though because authorities can pounce anytime which is why the real forward thinking people look to move money abroad to invest and start a new life once they have obtained enough money. It’s easier said than done! When money is accumulated so easily and quickly, it’s hard to suddenly quit and move abroad. Humans are greedy and that is our downfall. I don’t believe that FBB is the only one who evade tax in C entertainment world. If the accountant in her company can come with a way to do it, the other companies must think about it too. The other big names must be worried now for their turn. Or they will be hoping that FBB become the only scapegoat. @windy good point there. I chuckled when I read your comment. FBB is not the only one doing the evasion thing. I smiled when you said the other big names must be worried now. There are so many of them involved in all kinds of corruption, from money laundering to tax evasion and God knows what else. Sometimes I want certain top ‘gods’ and ‘goddesses’ to get exposed, then I worry what it will do to their wordhippers. Fan Bingbings case is cotton candy compared to what they are up to. L.O.R.D. : Legend of Ravaging Dynasties 2 was originally slated to be released on 6 July 2018 but it was later announced on 27 June that the release will be postponed to a later date due to production reasons. I bet it’s because FBB is the lead actress in the film. If FBB really get banned, can the films and series she was involved in still see the light? @kidd Who knows. The rules are not that all consistent. @kidd When actors are involved in certain negative situations, it is tricky decision to release their projects. Look at Kevin Spacey. His latest film was released about three weeks ago and only made $129 during its opening debut. Before his sexual harassment accusations, he was a box office draw, pulling in millions during opening weekends alone for his films. Chinese film star Fan Bingbing has been ranked last in a report judging A-list celebrities on how “socially responsible” they are, fuelling further speculation about the whereabouts of the actress, who has not been seen in public for more than two months. The 2017-2018 China Film and Television Star Social Responsibility Report, carried widely by state media outlets, ranks Chinese celebrities according to three criteria: professional work, charitable actions and personal integrity. It praises celebrities who have become “relatively strong role models”, but also highlights cases where it says they have had a “negative” social impact. But what is most notable is its 0% rating for Fan Bingbing, one of China’s biggest stars, who hasn’t been seen in public since 1 July when she visited a children’s hospital. The report was authored by academics at Beijing Normal University. That’s just a report made by a bunch of academics. It does not show actual popularity. Right after the report, there are fans who came out to defend her. A few fans blind support won’t change the general perception of the public. China is a country all about patriotism and if the state decides that you have committed a crime, it would take a brave member of the public to support the criminal. Unless England where we can announce how much we hate our Government at any given time and the USA where they can call Trump any name they want. I have seen chinese peasants living a life of poverty but still believe in the ‘I love China’ phrase. If FBB has committed a crime, it won’t matter if the crime is rife in the country; supporting her will be going against the country’s supposed principles. I will be surprised if she does not retire from showbiz if charged…. Everyone evades tax. Some even surrender to their accountants and just blindly sign. Not sure fbb is which category. Perhaps just fine her a lot and let it be? I mean I can’t imagine how she can survive prison! Is she really in prison?? Frankly she should have run to usa. Now too late. I think her crime is beyond tax evasion. Everybody evades tax. It could be she knows but doesn’t care about details. Who does anyway? When you have so much you hire an accountant. Accountant does everything I don’t think shes that bright in finances rise? Maybe she opened some off shore account as well? I don’t think it is greed. It is more like standard practice. Ruby lin should be careful. She also invests heavily. I feel sorry for him. I mean to see your beloved family in jail or prison or under house arrest is scary and painful.